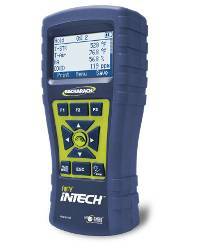 The Fyrite ® INSIGHT ® Plus is Bacharach’s premium residential and light commercial combustion analyzer. 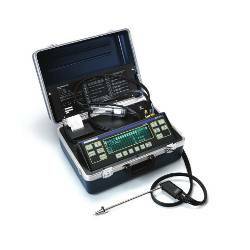 This American-made analyzer uses advanced technology to accurately measure, analyze and report results that validate safe operation, efficiently tune older systems and save customers’ money. Powered by innovative Tune-RiteTM software, the industry’s first-ever on-demand HVAC “assistant,” it helps both new and seasoned technicians save money by making more thorough and efficient service calls. Featuring industry-exclusive B-Smart ® CO sensor technology, it enables technicians and HVAC/R service representatives to install pre-calibrated sensors right in the field to avoid costly downtime and inconvenience. 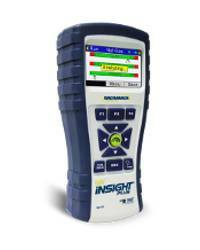 The Fyrite ® INSIGHT ® Plus is a five-in-one steady state combustion analyzer that is capable of measuring flue gas and room air CO, and can also function as a dual channel digital thermometer (up to 999o F) and a digital manometer (which measures draft, gas pressure, ESP, and up to +/- 40 INWC). A technological first, Tune-RiteTM is an on-demand “assistant” that will help you save money and win customer loyalty by documenting more thorough and efficient service calls - with fewer callbacks. Based on the appliance type, Tune-RiteTM helps you to determine if it’s operating safely and in the acceptable ranges. If not, you’ll get a list of possible causes related to the readings and an easy-to-navigate troubleshooting checklist. The change in the percentage of oxygen in the flue gas mix, which assists in determining if there is excess air or excess fuel in the combustion process. The change in Carbon Monoxide (CO) over time - CO levels will spike during the initial fire which is normal, but they should normalize to a lower output as steady-state is reached. 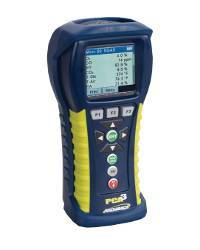 If a steady-state is not reached, the equipment may require major tuning, repairs or replacement. Tune-RiteTM helps service technicians to start the analysis at the optimum time, yielding more accurate readings and an effective diagnosis. Once this stable condition is reached, combustion analysis can be performed. Tune-RiteTM software eliminates the guesswork commonly involved in determining steady-state by showing you a live graphical representation of all combustion parameters as they settle into a steady-state condition. When the combustion equipment reaches steady-state, a red dot displayed on the LED readout changes to green and is ready for analysis. It’s that simple. What Readings Should You See During Testing? The simple answer is, it’s not simple. 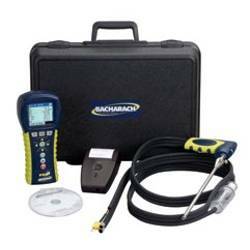 Measured values of oxygen, stack temperature and carbon monoxide vary depending on the heating equipment and fuel type. Even seasoned pros find it challenging to keep up with combustion guidelines for all possible equipment types and manufacturers. Sometimes furnace or boiler manufacturers will detail the optimum ranges in their installation manual – however tracking down the information can be difficult. Fortunately, Bacharach has done the homework and programmed into the Tune-RiteTM software typical ranges for these parameters based on the fuel and equipment type. Those ranges can be seen in an easy-to- read bar graph format, along with the current values. Green, red and yellow indicators show whether the readings are in range (green), out of range (red), or unstable (yellow). What If The Readings Are Out Of Range? ombustion analysis results that are not in the expected ranges indicate there is a problem. Depending on the readings, it is possible to narrow down the potential causes of a problem. Tune- RiteTM software recommends possible causes for out-of-range measurements - and it will display a prioritized list of most likely potential issues to investigate. A drill-down into a “checklist” helps to keep track and record what has been inspected, adjusted, repaired or found to be an issue. With today’s informed homeowner, the importance of “proof of service” is critical for customer trust and loyalty. Homeowners may be skeptical until they see a detailed service record. Using “As Found” readings taken before you’ve analysis performed any service and then recording the “As Left” readings, clearly documents the results of the adjustments or repairs that you’ve made. Tune-RiteTM helps you do that with easy-to-store data, along with a checklist of issues that you have reviewed and possibly corrected. Stored records can be printed immediately as a comprehensive account of your work which presents a professional and credible record of everything that was done during the service call. 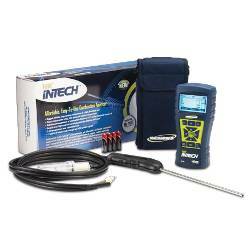 Contents: Fyrite ® INSIGHT ® Plus: instrument comes with probe, spare filters, protective rubber boot, 4 AA batteries, user manual and hard-carrying case.